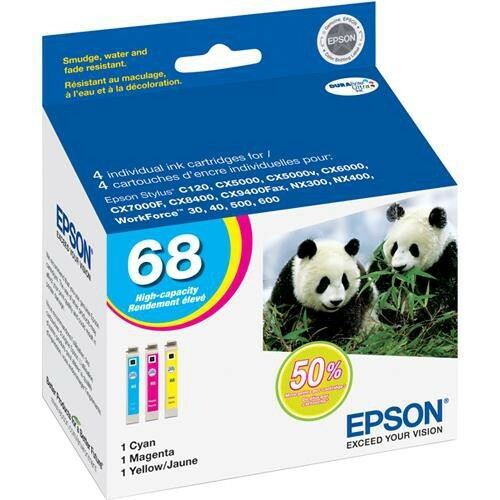 The Epson 68 High-Capacity DURABrite Ultra Ink Cartridge Multi-Pack comes with 3 individual color cartridges (Cyan, Magenta and Yellow). DURABrite ink is acid-free, and resistant to water, fading, and smudging. Additionally, the ink does not bleed and is therefore ideal for double-sided printing. Box Dimensions (LxWxH) 4.75 x 4.55 x 2.85"
68 High-Capacity Multi-Pack Color DURABrite Ultra Ink Cartridges is rated 4.4 out of 5 by 27. Rated 1 out of 5 by Maximillian from Great Source for Epscolor ink cartridges My Epson Work Force 600, wireless multi function is a work horse printer at home. This printer is used wirelessly by two desk tops and three laptops/notebooks regularly. Therefore, the printer uses a lot of ink. I have tried non-OEM ink cartridges at some what cheaper prices, but the quality is never satisfactory, besides which they tend to clog up the ink spraying jets after changing the cartridges a few times. This is very annoying, and is not worth the few pennies you save. I recommend B&H Photo highly for the price ... The savings are the best I have found on the 'net. Rated 5 out of 5 by Molly's Mom from Good value for inkjet printer ink I have an Epson all-in-one for home use. Sometimes I use it quite often and other times it can sit idle for weeks. In the past, my inkjet printer ink cartridges would dry out or I'd have to clean the printer heads before each use. Since I bought the Epson and started using these cartridges, that hasn't been a problem. Rated 5 out of 5 by Chris from Epson ink is consistent. Once, only once I used reloaded ink cartridges from the local box store. It ruined my printer and ran onto the table under my printer. Never again will use refilled ink. Sticking with real Epson ink. Rated 4 out of 5 by tevans from INK JET nothing to say INK is INK Epson has you as aftermarket ink clogs up the jets. Of all the INK jets I have owned Epson is the better. Sometimes its cheapoer to buy a new printer rather than ink. Rated 1 out of 5 by Kurt from nearly expired Spent a lot of money for these ink cartridges, and the ones I received (in a dusty box) are set to expire in 2 months. I won't need them until later this year, so I'm out of luck. Rated 5 out of 5 by The Preacher Man from Good buy, and the service was great! I'm satisfied with the Epson Cartridges and even though the delivery was wrong the first time, I liked how B&H handled the transaction. I will buy from this seller anytime. Rated 4 out of 5 by amc from Great ink in higher capacity size The DURABrite ink makes great qulaity prints and copies. Having the higher capacity cartridges is convenient and cost effective. I would definitely buy this size again.